Space shuttles Atlantis (left) and Endeavour are poised on their pads for a rare double view on April 18, 2009. For what may be only the fourth time in history, two spaceshuttles sat exposed on NASA's two launch pads at the Kennedy Space Center inFlorida this weekend. The rare sight came to a close Monday as eachshuttle was covered by rotating sections of their pads' structures. As spectacular as it may have been, NASA hopes it'll be the last such simultaneous view forthe shuttles, although they have had that expectation before. That there are two shuttles on two pads, visible or not, is in itself rare,occurring only 18 times over the past three decades. A prior double shuttle view in September 2008 was intended to be the last in the vehicles' history but a failure aboard their mission's target resulted in the launch delay that led to this weekend's repeat rollout. Space shuttle Atlantis was already on Pad 39A on Friday when its sistership Endeavour arrived at 39B, 8,000 feet away, duplicating the scene fromlast fall. Atlantis is scheduled to launch with the STS-125 crew on May 12 to upgradethe Hubble Space Telescope (HST). The unexpected failure of theobservatory's science data system in September resulted in NASA standing downto give HST's managers the time to prepare a replacement. In the meantime, Atlantis was rolled back from the launch pad to make way fortwo other missions to fly first to the International Space Station (ISS).Atlantis returned to the pad on the morning of March 31. Because STS-125 is not flying to the ISS, its crew does not have the addedprotection of taking safe haven on the station should Atlantis be damagedduring flight. To offset that risk, NASA decided to ready a second shuttle onthe second pad as a rescue ship, to launch as needed. Endeavour was to serve that role when STS-125 was first targeted for an Octoberlaunch. After the HST developed its delay-inducing problem, NASA releasedEndeavour to launch on its own STS-126 mission, which last November flew to theISS to deliver supplies. Shuttle Discovery, the third orbiter remaining in NASA's fleet, also servicedthe station in the interim, completing the outpost's backbone truss anddeploying the last set of its power-providing solar array wings during theSTS-119 mission last month. Endeavour, now being readied to return to the station on STS-127,was rolled out to Pad 39B on Friday morning to again first stand poised insupport of STS-125. If Atlantis flies safely, Endeavour will be moved to 39A inlate May, marking the last time in history that a space shuttle was on 39B. With the shuttles scheduled to be retired next year, the pads are to beconverted to launch the next generation of NASA crewed vehicles, the Constellationprogram's Ares rockets, with work already underway to modify Pad 39B. To protect the orbiters and prepare them for their launch, a 102 foot long by130 foot high section of the pad called the rotating service structure (RSS) ismoved along rails until it covers the orbiter. The RSS is usually only openedjust after a shuttle arrives at the pad, when the payload arrives to beinstalled inside the orbiter's bay, or just prior to launch. This weekend's view of Atlantis and Endeavour was the result of overlappingschedules. Endeavour arrived at its pad just two days before Atlantis' payloadwas rolled out to 39A. In addition to affording a photo opportunity for the press, the exposedshuttles were also visible to tourists lucky enough to schedule a trip to theKennedy Space Center Visitor Complex this past weekend, as well as by NASAemployees and their families given the fortunate timing of a long-planned openhouse on Saturday. As a result, this most recent and likely last view of sister shuttles on theirpads may have also been the most well viewed in history, with over 50,000having been expected for just Saturday's "Family Day" alone. Before thispast weekend's and last September's views of Atlantis and Endeavour,photographs have been identified depicting two previous similar occurrences inSeptember 1990 and August 1994, showing Columbia with Discovery and Discoverywith Endeavour, respectively. It's possible that other dual views took place,as NASA's records only indicate when two space shuttles have stood on two padswithout notating their service structures' position. 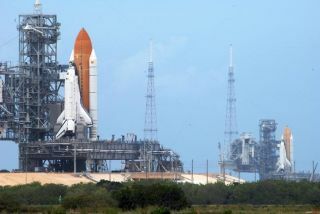 Click here to seemore photos and a complete list of NASA?s rare two-shuttle launch pad line-ups.